I just wrote about my first (although it probably wasn’t really) peak spiritual experience. I hope to eventual go back and write about more of them, but I want to record my most recent experience while it is still fresh. This happened about a month and a half ago. I had felt like I was whirling around, too many ideas floating in my brain. I was everywhere and going no where fast… I kept thinking of things I ‘should’ be doing, or ‘could be doing’ and it was driving me crazy. I have way too many interests and talents and I felt pulled in every direction at once. It was crazy, because I am happy to be on the path I am right now, with the life I am leading. I just got a little lost in the ‘shoulds’ and judgments I felt coming from some family members and a part of myself I was hoping I had already left behind. I was thinking about different career paths, and areas of study, everything from nursing to theology and my brain just wouldn’t stop, even though nothing felt right. Then, when searching for a wedding present for friends, I came across a Wulfenite crystal at Ascendant Books. 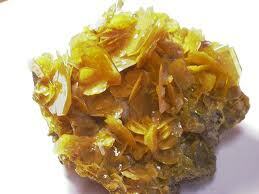 Actually, I started reading a description of what Wulfenite can do, before I saw the stone. It listed things like ‘Helps focus ideas and bring them into reality’, and ‘Good grounding stone’ and about 10 other things that just sounded like exactly what I needed at the moment. There were about 5 in the case, and the smallest one at the back-shaped like a small tropical fish, and just as beautiful, with it’s flakes of yellow jutting out in all direction started talking to me. ‘I can help you!’ It said earnestly, as it introduced itself as Wolfie. Now, this isn’t the first crystal life form I’ve communicated with, or it might have thrown me for a loop. Sometimes they communicate telepathically with words, and sometimes it’s whole impressions and images. I was shown how badly I needed help grounding and how it would pretty much help me in every facet of my life. Needless to say, we came home together. Actually, driving home was a bit of a surreal experience. I felt as though I were in a slightly altered state of consiousness, as though I had been meditating for awhile- with a beautifully calm mind and a stillness pervading everything. I had to be careful not to focus on the sensations too deeply so I could make it home in one piece. I sat in meditation with the stone for a few minutes when I got home, but didn’t really have time to delve it. That night, My fiance, a good friend of mine and I were spending the night out outside, listening to music, talking and hoop dancing. The two of them had just gone to the corner store, when I decided to turn off the music and sit with Wolfie for a bit. I settled down in a lawn chair, with my barefeet on the grass, and eyes closed with Wolfie settled into my hands. I began my mediation as I usually do, with the shielding and grounding exercise I’ve been doing for years… I let the roots grow from the soles of my feet and base of my spine down into the earth, but when I tried to stop and pull earth energy back up, I wasn’t able to… The roots kept growing, down and out, deeper, spreading into the earth, until they felt a kilometer wide, and deep… Then slowly, I felt the Earth’s energy rise through them. I had a beautiful visual image of this happening along with the sensation, and the process was exquisitely slow. As this energy rose through the soles of my foot, up through the base of my spine and burst out the top of my head, showering down my shoulders, I felt completely taken care of. 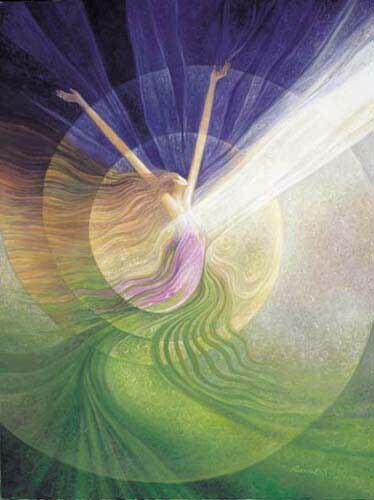 This Earth energy is the from Gaia, Mother Earth, and from the Goddess herself. The feminine energy that creates and maintains everything… I was being held up by it, and infused with pure, maternal love and affection. I opened my eyes and looked around as I was being filled with this energy and I saw the same energy radiating from all the trees, bushes, plants, earth- everything in nature.